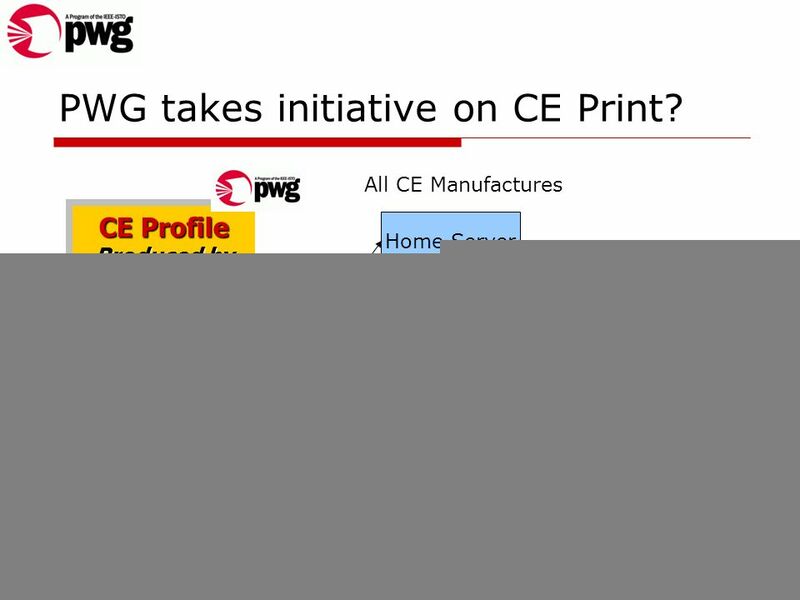 23 April 20041 PWG Consumer BOF Printing from CE devices. 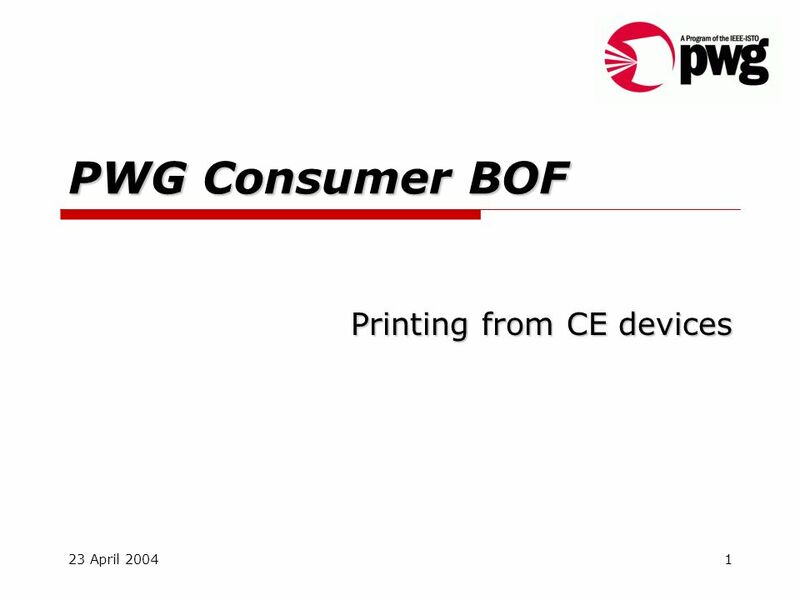 Download ppt "23 April 20041 PWG Consumer BOF Printing from CE devices." 1Copyright © 2008, Printer Working Group. All rights reserved. PWG-DMTF Alliance Work Rick Landau, Dell Printer Working Group (PWG) DMTF Alliance Partner. 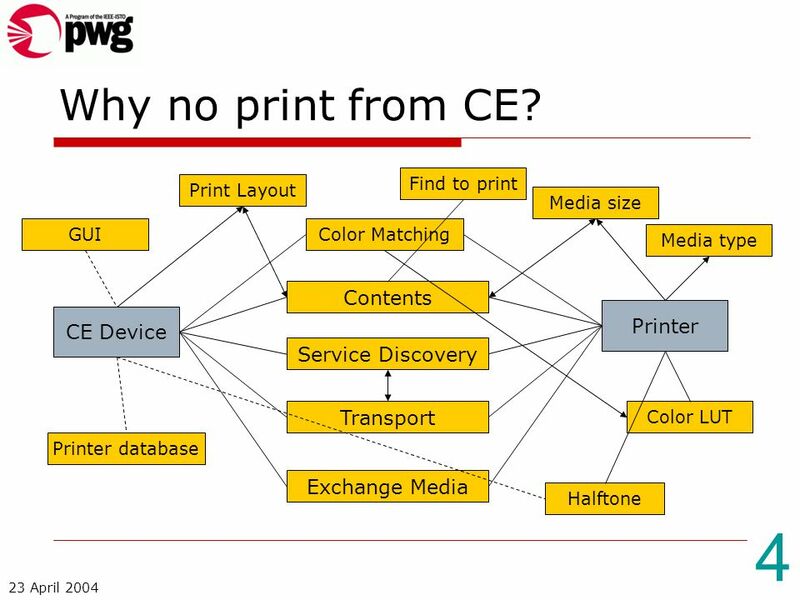 Internet Printing Protocol Extensions BOF IETF46 in Washington, DC November 9, 1999. 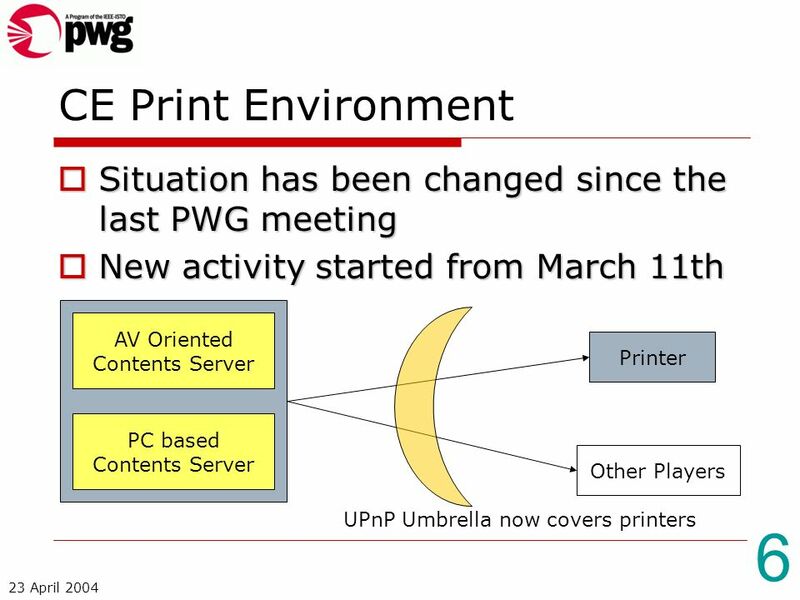 Universal Printer Description Format UPDF. UPDF Version 1.0 Agenda UPDF Overview –History –Design Last Call –Review changes –Approval or requirements. Universal Printer Description Format, version 1.0 IEEE ISTO PWG Semantic Model Universal Printer Description Format Print Services Interface IPP IPP Fax. Copyright © 2009, Printer Working Group. All rights reserved. 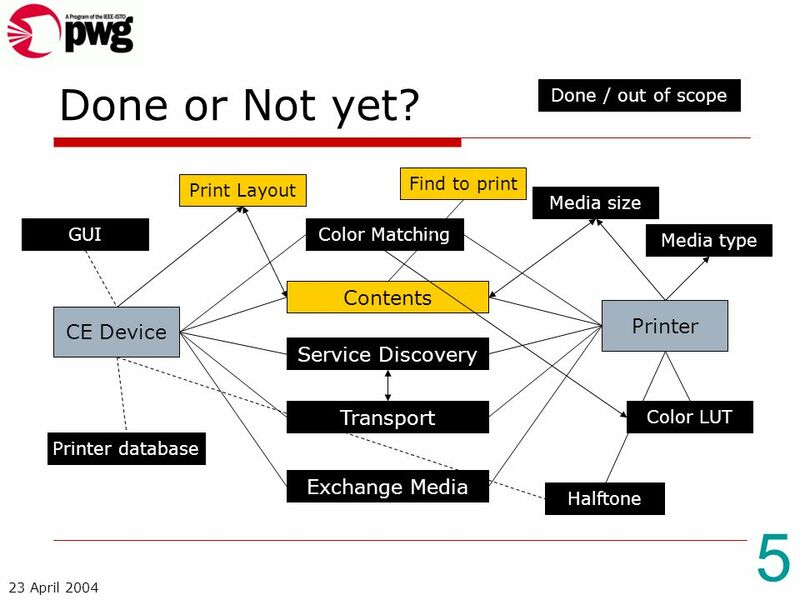 1 ISTO Printer Working Group Standards in Imaging and Manageability Lee Farrell Chairman. PWG-CIM Realignment Project Rick Landau Dell 12 July 2005. February 19, BMLinkS Overview for PWG BMLinkS Overview for PWG Members 1. BMLinkS Goals 2. Specifications 1. Discovery 2. Job/Device Control 3. Four Winds Digital Signage Nathan Byrer, MCITP:EA Technology Director University College, IUPUI 1. Communications Room: Router/WAP, Switch, Server, Patch Panel Communications Room: Router/WAP, Switch, Server, Patch Panel Hard-wired Ethernet Ports… Site. Doc. : IEEE /1078r0 SubmissionBill Carney (Texas Instruments)Slide 1 Wi-Fi Alliance Liaison Report September 15, 2004 Bill Carney Wi-Fi Alliance. November 13, 2003 Glyn Roberts – ST Microelectronics IEEE doc: IEEE pc Submission Project: IEEE P Working Group for Wireless Personal. UPnP AV WC Status Update (UPnP Summit 2003) John Ritchie – Intel Geert Knapen – Philips UPnP AV Co-chairs. UPnP* AV: Easy Sharing of Digital Media Joe C. Pitarresi Business Development Intel Research & Development. 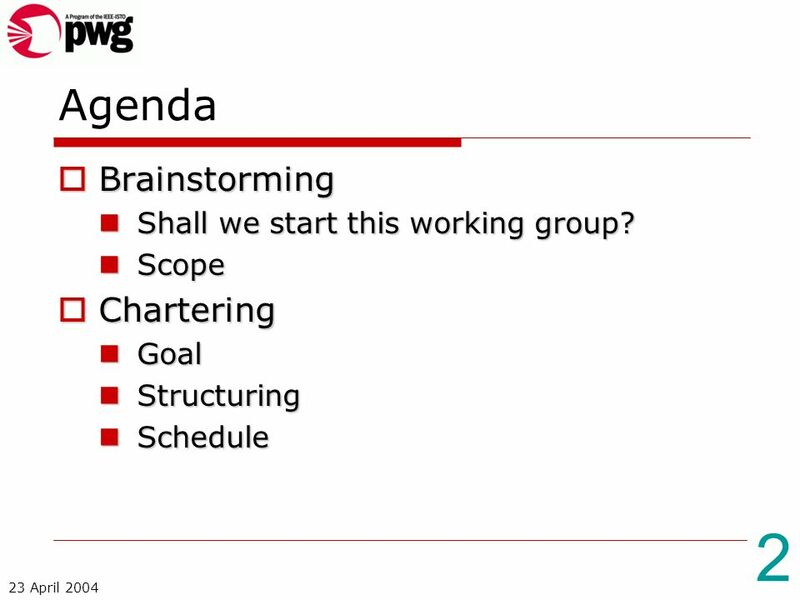 Purpose Scope Debriefing is a concept of providing a “Feedback point” to the program manager of the project scope and those who were involved in preparing. Digital Living Network Alliance: Building out the Digital Network Bob Taylor Member, DLNA Board of Directors March 2006. Secure Wireless Home Networks Area 2 SIR Presentation Nov. 18, 2004 Dean Steichen Br. 8.